When 1290 WMCS-AM radio station’s management wanted to do something special to commemorate their 25th anniversary of programming for Milwaukee’s African-American community, they envisioned a 20×24-foot historical depiction of the great stories, communicators, and radio station owners to be mounted on the exterior west wall of the studios at 4222 W. Capitol Dr. Their search via agencies and galleries led to a muralist with works in Milwaukee and across the nation: Ras ‘Ammar Nsoroma. 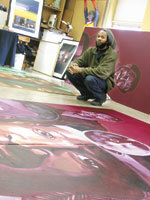 Now 37 years old, Nsoroma was a Milwaukee teenager when he noticed an inner-city mural by Reynaldo Hernandez. “It was outside on a building,” he recalls. “It was art and it was so accessible. You didn’t need to go to a museum to pay to see it. Didn’t have to listen to someone’s ideas and theories. It gave me inspiration. I could do that, too.” He did that by helping paint his first mural during his senior year at the Milwaukee High School of the Arts, and that led him to later studies at the Milwaukee Institute of Art and Design (MIAD) and the Art Institute in Chicago. Forty murals later, he’s still doing it. Look for his work in Washington, D.C., Chicago, and Los Angeles. Two of Nsoroma’s Milwaukee murals were selected for inclusion in “Walls of Heritage, Walls of Pride: African American Murals,” a collection of 200 murals recounting three decades…from the ’67 Chicago “Wall of Respect,” to the hip-hop 90s. Because they’re now an established art form, it no wonder that African-American muralists continue to create detailed visions of black history, with narratives that connect to the sociopolitical, spiritual, and aesthetic concerns of the surrounding community. In shaping the radio station mural, “The Tradition Continues,” Nsoroma worked from photographs to create 25 portraits of men and women associated with the station since it went on the air in 1979. Using acrylic latex paint on 15 separate 8×4-foot panels, he divided the mural into sections of color — green, orange, purple, aqua, and maroon. Four portraits, including Willie Davis, former Green Bay Packer great and station owner, popular radio personality Eric Von, and deceased radio personalities O.C. White and “Dr. Bop,” loom large and in full color. Davis says he feels good about the mural’s overall effect, adding that, “When you make a statement for art or artistic individuals, you’ve made a valuable contribution. Ammar created images and objects against the backdrop of the station’s history, and he did it with a sense of what is soulful, what has substance.” As for Nsorama, he feels, “Some artists believe in art for arts sake, without social values or concepts. I’d like my work to be an accessible vehicle to enrich the community, to use as a tool for healing or the betterment of the community.” If he has his way, his next project will transform a vacant lot at 37th and Center Streets, where the 37th Street Block Club, with support from various funders, is hoping to mark the spot with a memorial to victims of violence. A Milwaukee native, Davis is a free-lance writer currently living in Los Angeles.